I have to admit I am not a big fan of art quilts. I appreciate all the time and talent that go into them but I really don't want to make a large quilt to hang on the wall. That's what mini quilts are for. It's fun to try a new technique or use some of our precious stash to make a small quilt to decorate the wall. I like my quilts to be used and abused, loved and snuggled. This weekend, I took quilting in a different direction. I made art from a photo of a quilt square that I made for a bee. This is the very secret Stitch Tease Bee and this is my last square for round one. It's for my dear friend, Annabella, who wanted curves. I'm not allowed to reveal the real photo so I played with it on my iPhone to disguise the real piece that measures 24.5" square. I created a piece of art that I love and I just might order a canvas print of it to hang in my sewing studio. This is what it might look like with a simple black frame. I used an app called Glaze. It has a lot of great features. So I'll be watching for sales on BigCanvas.com or just order it at Costco. Their prices are pretty good for canvas prints and the service is really fast. So, this is my interpretation of an "art quilt". What is your opinion of art quilts? This also means I have finished another project on my 2013 Finish-A-Long. Stitch Tease round 1 blocks are finished. Love your version of an art quilt, it looks fantastic. Personally, I'm not a huge fan of art quilts, either. Just like you, I like my quilts to be used. I am trying improv curves now for my Madrona Road Challenge quilt. It is harder than it looks. Art quilts really aren't my thing. 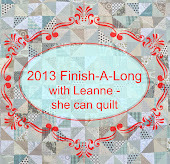 That being said, I did participate in an art challenge with the Chicago Modern Quilt guild. All participants submitted a photo/postcard of "modern" art that inspired them and a fat quarter of fabric that was supposed to represent you/your taste. Then we threw them in a basket and drew another out. I find more therapy in following directions rather than trying to be all artsy. I'm with you all the way - love to look at them, appreciate the skill involved but no intentions of ever making one! I love your version- very arty! I never thought I would hang a quilt on my wall but then I entered some swaps and then I tried some things and some challenges and now I have a lot of mini quilts - some that people made for me and some I made for me. I really still don't think of any of them as art quilts, just as fun little quilts. It is surprisingly fun to make something small sometimes. I love how you turned your photo into a picture. I'm with you 100%, but I do live the idea of Annabella's block being on your wall in a different medium. I'm with you on Art Quilts not being my thing generally, I like quilts that look like quilts more, and not so much picture quilts. If they're hanging on the wall, then great, as long as I am allowed to stroke them- it's the tactile nature of quilts I love! Ooooh I like the look of my block for my not what I really intended by way of neutrals quilt! I am so excited Di! Thank you so much!! No I don't really like art quilts either for the same reasons, but my mum does some great textile art - just need her to be brave enough to show it! I think art quilts are "nice" but not my thing, if you know what I mean? I agree with you, a quilt is to be used and loved and snuggled under and played with. I like Hadley, tend to walk past the art quilt section at shows with a quick glance. I much prefer a pieced quilt with patterns evolving from the piecing. Oh, I meant to say, I love your artistic creation! Makes you look like a talented oil painter. It's because I do better with a pattern that I ventured into art quilts (or mini art statements, if you like). They help me stretch and use techniques I wouldn't try otherwise, make my brain work harder to figure out how to do what my mind sees. Anyway. I'd buy a copy of the piece you've shown - how totally cool!!! when I first saw the picture, I thought you had painted it. It's beautiful! You sould order a print!! That's a great interpretation and quite lovely. 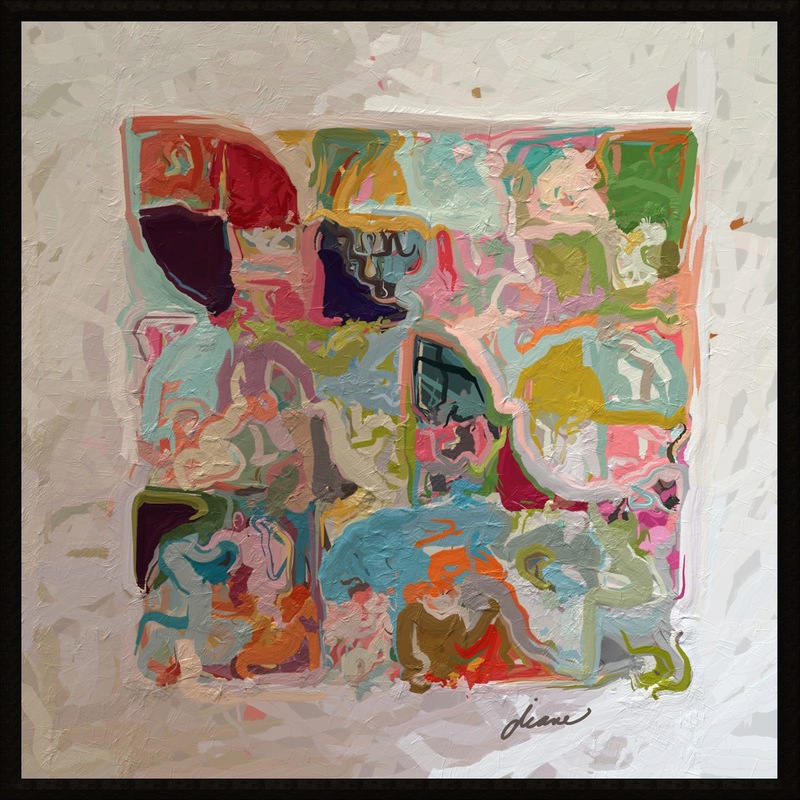 I like quilts in all their "forms" ……..